Frames all have specific sizes. How do you know which size frames fit best on your face? Don’t worry, you probably have the information you need right at your fingertips. Well, once you take your glasses off, at least. Most glasses have the size stamped right on the temple (the piece that goes behind your ear). If it’s not there, often it’s engraved behind the bridge of the glasses. Sometimes, you find numbers on both the bridge and on the temple. The measurement is usually written similar to this: 51-16-135. If the numbers are in different places on your frame, you can place them in the right order. Frame size is often found on the inside of the frame's temple. The first number concerns lens width: Measured from the outermost edges of the lenses horizontally, and can be anywhere from 35 mm to 62mm approximately. The middle number measures bridge size, or more specifically: The distance between the lenses (DBL), which can be anywhere from about 12 mm to 26 mm in size. The last number expresses temple length: Length of the temple piece (a.k.a. arm or ear piece), which can be anywhere from 120 mm to 170 mm. Once you know the size of your favorite pair of glasses, you can find a new pair of glasses that will fit just as comfortably. Also, measuring the total width of the frame may not be a bad idea, that way you can avoid ordering a frame that is too small or wide for your face. The frame width is the measured from the far outer edge (including the frame). Lens width: Frames that are within 2mm of your old frame would be acceptable. Your old frames measured at 51, so a range of 49-53mm would be fine. Bridge size: Look for sizes within 1mm of your old frames (measures 16 on your old frames, so look for 15-17mm). If you’re getting a metal frame with adjustable nose pads, using a range of 2mm is acceptable (14-18mm). Temple length: Our example measures at 135, and we recommend you look for frames that have the same temple length. If you must vary from the measurement, stay within 5mm (130-140mm in this case). Another very important measurement is total frame width. Total frame width is not written on a frame, and needs to be measured by you; simply adding up the lens widths and the bridge width is not going to cut it, as this only measures the frame from the edge of one lens to the other. Total frame width measures the entire span of the glasses, including the rim. Once you've measured your old, comfy, most favorite pair of glasses for this value, you can search for another frame with the same width on our website. This way you can be sure that your new glasses will be just as wide as your old ones, and look proportionate on your face. For acetate, TR-90 and other plastic-material frames with fixed nose bridges, the SBF number is also important. SBF stands for "standardized bridge fitting", and measures the actual space needed for your glasses to fit well on your nose. 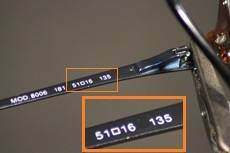 As we stated earlier, the number printed on your glasses only measures the smallest distance between lenses. Glasses with the same bridge sizes can still vary in size greatly, depending on the shape of the lenses and the thickness of the frame. Read more about SBF and how to measure it here. 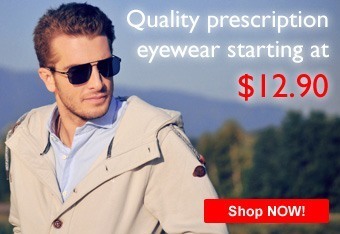 Simply move the sliders to your specified range to find glasses your size. Searching for a specific size, or range of sizes, is easy. Once you have obtained your measurements, you can use the sliders in the frame search bar to define your range! This way, you will only be shown frames that will fit you as perfectly as your old pair of glasses.